The new Spring 2019 batch of Old Fitzgerald Bottled-in-Bond will be the oldest liquid on the national market yet. The third release of Old Fitzgerald Bottled-in-Bond Bourbon will be 13 years old, according to an announcement made by parent company Heaven Hill Brands this morning. It will be the oldest released nationally (a 14-year bottle was sold once as a distillery exclusive). Heaven Hill debuted the new vision of Old Fitzgerald just over a year ago. It is designed as a premium, moderately aged whiskey in a decanter, each one denoting both the original barreling season of the whiskey inside, and the age of the liquid once pulled from the barrel. In order to say “Bottled-in-Bond” on the label, spirits must be aged at least 4 years, and the liquid inside must be made up entirely of liquid produced during one bonding “season,” described as either spring or fall of a particular year. They must also be bottled at 100 proof, or 50 percent alcohol. A second, much-beloved Heaven Hill Bottled-in-Bond whiskey was discontinued late in 2018. At 13 years of age, this Spring 2019 will also be the most expensive release at $130 per bottle. They’re expected to be on shelves in the next few weeks. 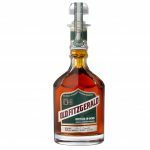 The post The Newest Old Fitzgerald Bottled-in-Bond Will Be the Oldest Yet appeared first on The Bourbon Review.